Today I feel accomplished. We have a stream that runs thru the property and the only running water we have on all of the property. The first day I was here I tried to go to the stream to see how I was going to get water. I didn't really make it. I got to the rocks of the stream but not to any water before I fell flat on my side and got a HUGE bruise. 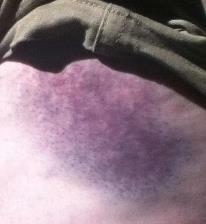 The bruise ended up being larger than softball size on the top of my thigh. Well to say the least I didn't go back to that stream and just bought a jug of water from the dollar store every day. I would bathe with one jug of water in the middle of the night in our yard right outside my shack. Then the nights got a little cold so I started using those bathing wipes you find next to the adult diapers. I was clean but never felt all that clean. Today I made it to the stream. Not only did I fill up 2 jugs of water but I bathed in the running water. It wasn't deep but enough trickled down to fill up the jugs quite nicely and boy did it feel good to bathe with running water. Then I would say CONGRATULATIONS is in order!!! Hope your bruise has healed!!! Love YOU!